This bit of the moon wasn’t brought home as cargo by Armstrong, or any of the other 11 men who have walked on the moon. It was blasted off the surface of the moon by an asteroid, and hurled toward the earth, where it was discovered. But it is a piece of the moon. And I did set foot on – or, at least, above – it. This took place at one of the most unusual and interesting sites I have visited in a long while – the Aga Khan Museum in Toronto. First point of interest is the current exhibition, “The Moon: A voyage through time”, on through mid-August. Centrepiece of this exhibition is a gigantic, three-dimensional “Moon,” hanging in the main gallery. This fantastic, internally illuminated piece measures five metres in diameter, and features detailed NASA imagery of the lunar surface… including the “dark” side of the moon never seen from the earth. The sculpture, created by British artist Luke Jerram, will fascinate anyone who has ever stood in their back yard under a full moon, simply basking in the wonder. There’s a lot more to the exhibition than the “Moon” sculpture and the fragment of rock. And that’s where the exhibition – in fact, the entire Aga Khan Museum – is truly both “unusual and interesting. 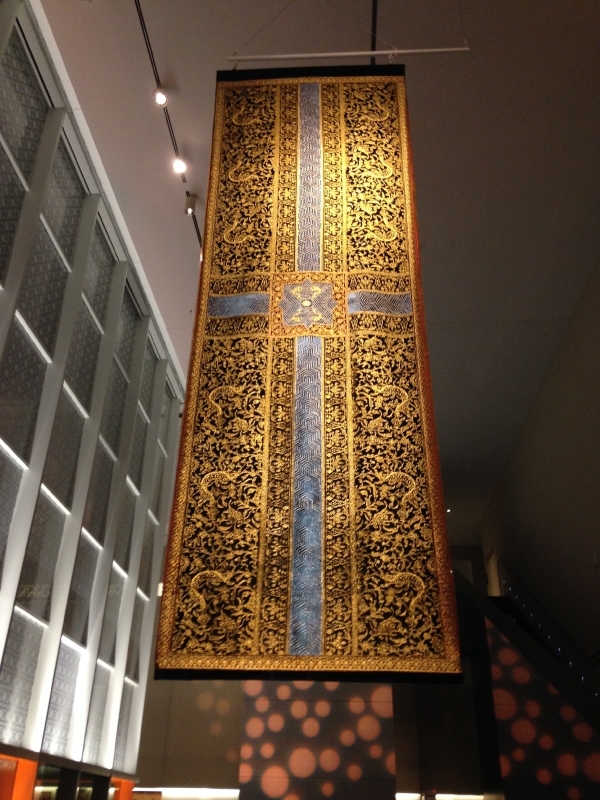 Because – especially, perhaps, for a guy raised in rural Ontario, who lives in a small town, and whose religious affiliation is “Christian” – the Aga Khan Museum introduces us to a very different view of the world. The “Moon” exhibit is faithful to that mandate, as well – the objects on display are in the main from the Muslim world. The sickle moon has long been a key symbol for Muslims. What’s the story behind this museum? In brief, the Aga Khan is the spiritual leader of the Shia Ismali Muslims around the world. The Toronto museum, funded by one of his charitable causes, opened in 2014. It’s a spectacular architectural accomplishment – beautiful, imposing; in fact, this building is an exhibit in its own right. To my Wilmot township eyes, the artifacts on display are alien but fascinating, at first mysterious and then highly informative. Informative because I have so little experience of Muslim art and culture that almost everything I see is new and intriguing. I was stopped cold by the soaring tapestry, entitled “Your Way Begins on the Other Side”, made by artist Aisha Kalid, using 1.2 million gold-plated steel pins. As the guy who put together the book “Piecemakers”, the history of the Mennonite Relief Sale and Quilt Auction, I had to stop and savour this amazing piece of fabric art.